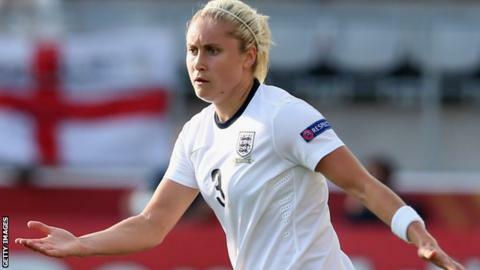 Defender Steph Houghton has been named as the new England women's captain. The 25-year-old, who replaces Casey Stoney, will lead the team against Montenegro in their opening 2015 World Cup qualifier in Brighton on Saturday. The Manchester City centre-half, who has won 44 caps, said: "To captain my country is something I've dreamed of since I was a little girl." Head coach Mark Sampson said: "Steph has many of the qualities needed to be an inspirational leader." Houghton has already captained England twice - in a friendly against Norway in January, and in the Cyprus Cup against Canada. She led Arsenal to an FA Cup and Continental Cup double in 2013, before moving to Manchester City in January. Sampson said: "She's honest, hard-working, ambitious and has a winning attitude. She also has the room and time to improve as a player and grow as a leader, which fits in perfectly with our vision for the team. "She is being passed the armband by an incredible leader in Casey Stoney, who has been a fantastic England captain and ambassador for women's football." Stoney, who has won 116 caps, is back in the squad after recovering from a foot operation. Houghton said: "We have such a talented group of girls, and to put on the armband and lead them out in a World Cup qualifier will be a tremendous honour." An England debutant in 2007, injuries prevented her from appearing in that year's World Cup and Euro 2009, but she did feature at the 2011 World Cup and during a disappointing Euro 2013 campaign. Houghton was part of the Great Britain team for London 2012, scoring the winning goal in a 1-0 victory over Brazil at Wembley.